During the week beginning Monday 11th February, GMS will be running a Careers Week. During this week, teachers will be discussing careers related to their subject areas in all classes. Students from year 7 to 13 will be able to discuss links to career paths with their tutors and subject teachers. 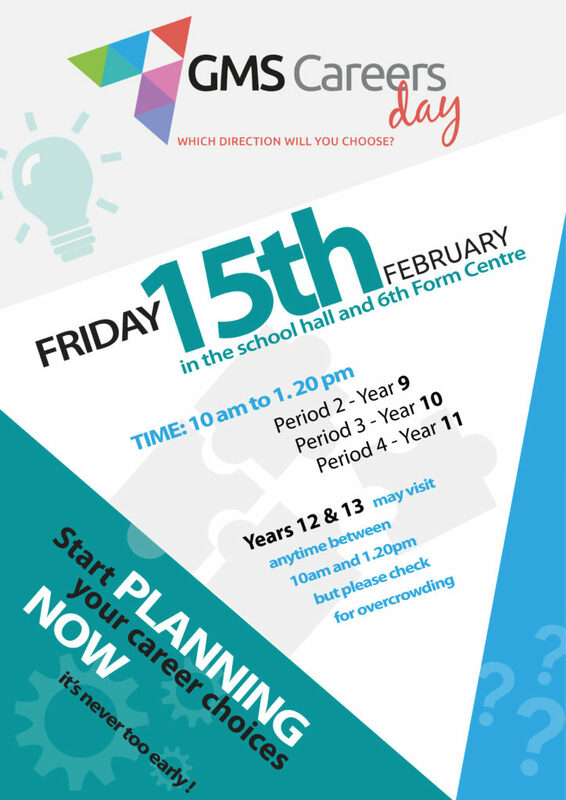 The week will culminate in the Careers Fair on Friday 15th February. We have invited many guests to set up stalls in the Hall and the 6th Form Centre ranging from the Army and Police to architects, apprenticeships and solicitors. Years 9 to 13 will have the opportunity to discuss potential career paths with local, national and international businesses. Over the academic year and throughout their time at Great Marlow School, students in each Key Stage will be provided with the opportunity to speak with employers, listen to visiting speakers, take part in careers-based workshops and attend visits which include a career focus. The GMS Careers Day on 15th February is an ideal opportunity for all students to ask questions to experienced individuals about their profession or job; experts will advise on suitable subject choices required to access the various careers represented.